After three years, Beth Temple returned to ERA404 to revamp her consultancy site. 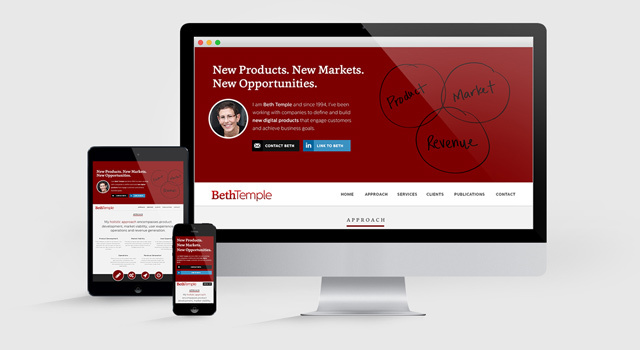 Following the launch of bethtemple4u.com in the Spring of 2012, user analytics guided the shift in strategy to the areas where her customers most responded: her publications. With this understanding and the data to support it, ERA404 created a user experience to drive traffic to her posts on LinkedIn and her presentations on SlideShare. The fully responsive one-page site heavily promotes the split calls-to-action of directing users to follow her through social media, and contact her through multiple preferred methods.